Carved stone post by the B6001, in parish of GRINDLEFORD (DERBYSHIRE DALES District), Grindleford, E of Sheriff Wood (Leam Hall), set in stone wall, on West side of road. Grindleford stone Erected by the Chesterfield & Hernstone Lane Head (& branches) turnpike trust in the 19th century. 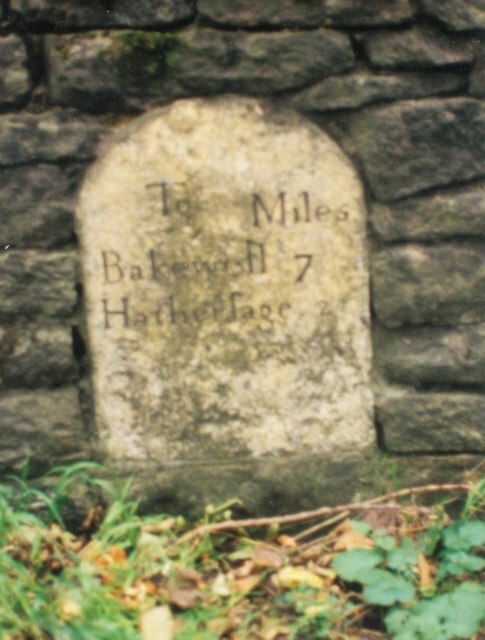 Inscription reads:- : To / Miles / Bakewell 7 / Hathersage 2 / : : : . ; . Milestone Society National ID: DE_BKHT07. © Copyright J Higgins and licensed for reuse under this Creative Commons Licence.